CHICAGO—Join the Association for Library Collections & Technical Services (ALCTS) on Monday, June 24 at 10:30 a.m. for its President’s Program featuring Dr. Marcia Chatelain. Associate Professor of History and African American Studies at Georgetown University, Dr. Chatelain is the author of the 2015 book, South Side Girls: Growing Up in the Great Migration and the chapter, “The Politics of the Drive-Thru Window: Chicago’s Black McDonald’s Operators and the Demands of Community” in Building the Black Metropolis: African American Entrepreneurship in Chicago. There are few generators of black wealth in the United States greater than fast food franchising, and the days of black-owned funeral homes, insurance companies and banks anchoring the central business district of the once labeled ‘colored sections’ of cities are long gone. In their places: McDonalds, KFC, Taco Bell and other fast food joints in the now simply segregated quarters of our cities, suburbs and exurbs. We think we know the story of what the presence and impact of fast food in communities of color means. However, few have stopped to ask the most important questions: How did we get here? How did fast food outlets spread across the South Side of Chicago, the central core of Los Angeles and the southeastern quadrant of Washington, D.C.? How did a concept borne in the suburbs become a symbol of urban deficit—nutritional and economic? Marcia Chatelain’s forthcoming book, Franchise: The Golden Arches in Black America tells the story of black capitalists, civil rights leaders and even radical nationalists who believed that their destiny rested with a set of golden arches. And it tells of an industry that blossomed at the very moment a freedom movement began to wither. Dr. Chatelain is a frequent speaker and writer on African American history, race, inclusive teaching and food justice. Following the 2014 killing of Michael Brown in Ferguson, Missouri, she created the collaborative #FergusonSyllabus, a resource listing resources that could be used to teach students about the shooting and its antecedents. #FergusonSyllabus has been a model for similar teaching projects online and has helped develop curricular projects in K-12 settings as well as academia. 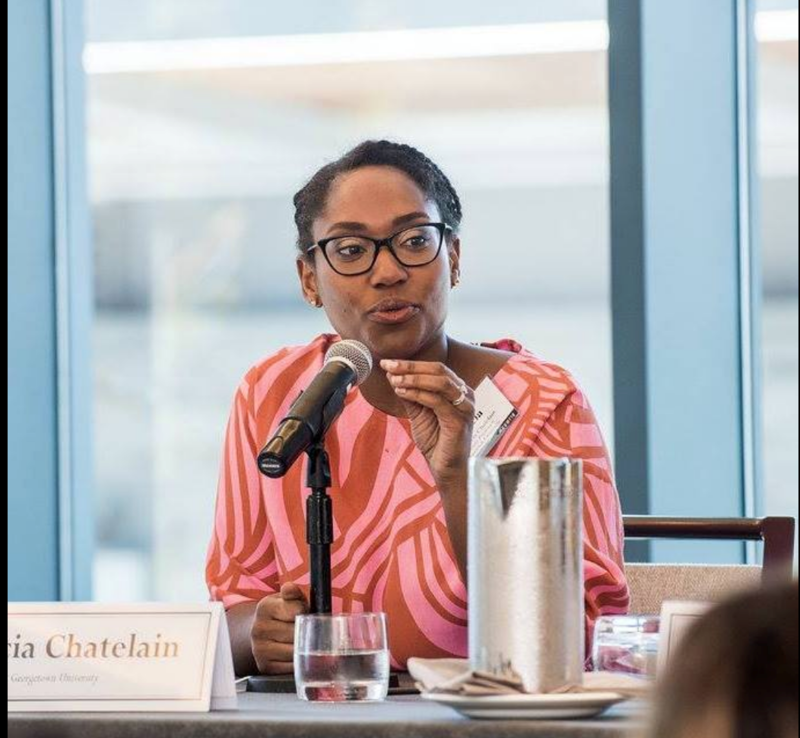 Chatelain has contributed to TheAtlantic.com, Time.com, Ms. Magazine and The Chronicle of Higher Education and has appeared on local television and national outlets including C-SPAN, MSNBC, CNN, BBC-America and PBS. Chatelain hosts “Office Hours: A Podcast”, a podcast geared toward millennials. She is a graduate of the University of Missouri-Columbia, where she was a Harry S. Truman Scholar, and she holds a Ph.D. in American Civilization from Brown University. In 2016, Chatelain was named a “Top Influencer in Higher Education” by The Chronicle of Higher Education. She is currently the Eric and Wendy Schmidt Fellow at the New America Foundation in Washington, D.C., and, during the 2017-2018 academic year, Chatelain received a National Endowment for the Humanities Fellowship.